Press Release--With Filipinos once again acknowledged as among the most active social media users — via FaceBook, Twitter, Multiply, Tumblr, Flickr, YouTube, etc. — Filipino bloggers are challenged to explore the potential of social media as a transformative force in Philippine society. 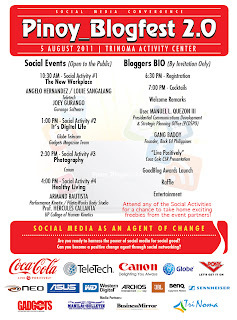 “Social media as an agent for change” will be the theme of Pinoy_Blogfest 2.0, happening on Friday, 05 August 2011, at the TriNoma Activity Center in Quezon City. Leading the discussion will be prominent social media activists Usec. Manuel (Manolo) L. Quezon III and Ms. Gang Badoy, who will share their thoughts on these two basic questions: How can we harness the power of social media for the social good? 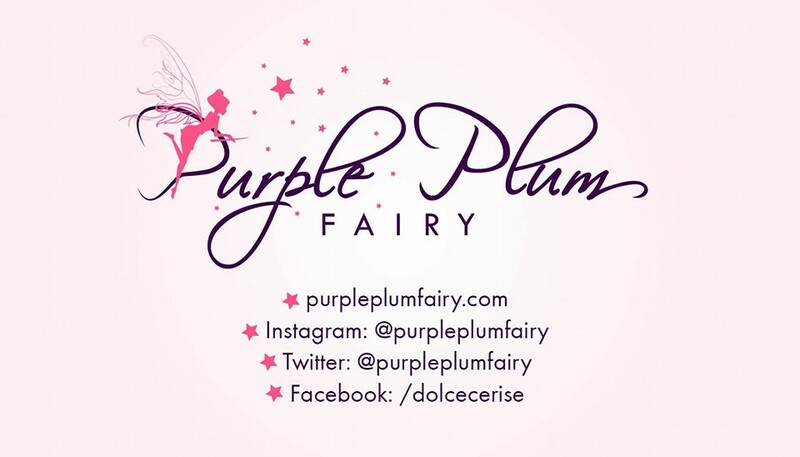 Can bloggers become positive change agents through social networking? Both Usec. Quezon and Ms. Badoy will be the main speakers during the Blogger’s BIO (By Invitation Only) programme, scheduled from 7:00 to 10:00 pm as the culminating activity of Pinoy_Blogfest 2.0 on Friday, 05 August 2011. Manolo Quezon is a popular essayist and blogger, who is currently an undersecretary of the Presidential Communications and Strategic Planning Office. Prior to this, he hosted The Explainer and The Explainer Dialogues on ANC cable news channel. He also headed the Speaker’s Bureau and was a columnist and editorial writer for the Philippine Daily Inquirer, and was the assistant managing editor for the Philippine Free Press weekly news magazine. Usec. Quezon has received various awards for his professional work, including being named “Opinion Writer of the Year” in 1994 and 2005 by the Rotary Club of Manila’s Journalism Awards, one of the oldest journalism awards in the country. He also won the 1st Prize for the Essay in English for the Carlos Palance Memorial Awards for Literature in 1997. Ms. Gang Badoy is a media practitioner and alternative educator. A product of the Assumption San Lorenzo High School, UP Diliman and the Indianapolis-Purdue University, she worked first for ABS-CBN in San Francisco and became news desk editor for NBC’s Eyewitness News. In 1999, she accepted a post with the Diocese of San Jose, California, and worked closely with Catholic Relief Services. She came home to the Philippines in mid-2003 and joined Jesuit Communications (JesCom) and spearheaded workshops on “Media and Ministry” for the East Asian Pastoral Institute. Primarily a writer, Ms. Badoy founded Rock Ed Philippines, an alternative education volunteer group that works for a more interesting way of presenting socio-civic issues to the youth. She also devotes time to giving media literacy lectures in campuses all over the Philippines, and is a staunch volunteerism advocate. Ms. Badoy was awarded as one of the Ten Outstanding Women in the Nation’s Service (TOWNS) and Ten Outstanding Young Men (TOYM) for 2010. 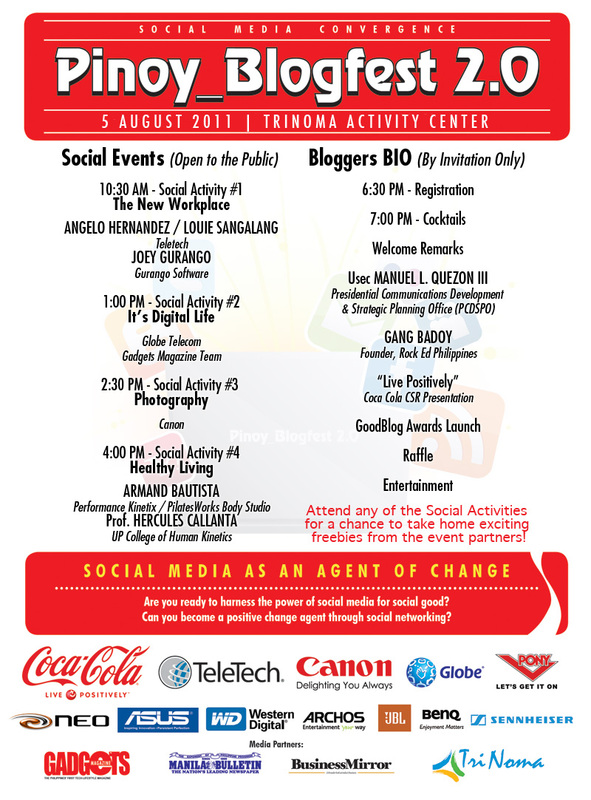 Pinoy_Blogfest 2.0 is a whole-day event, with several Social Activities targeted at various audiences. 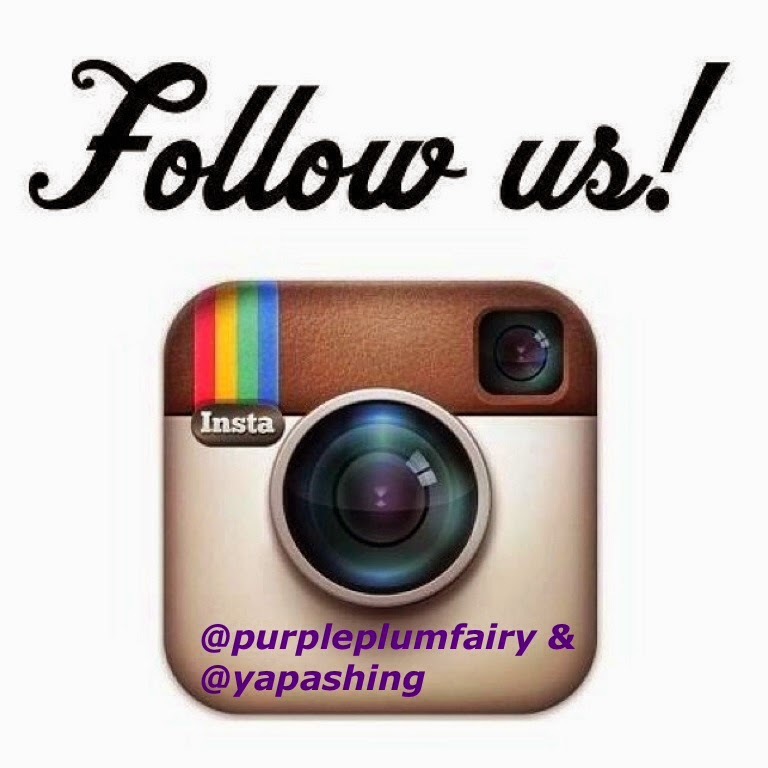 These are open to the public, as follows: 10:30 am to 12:oo nn – The New Workplace; 01:00 pm to 02:30 pm – It’s A Digital Life; 02:30 pm to 04:00 pm – Photography; 04:00 pm to 05:30 pm – Healthy Living. With expert resource persons for each of these social activities, the public will surely find the sessions both educational and entertaining. On-site registration will give the audience a chance to win raffle prizes and other give-aways. BenQ, JBL, Sennheiser, Manila Bulletin, Business Mirror, and TriNoma.